The Index opened huge up and went up to touch the highs of 8740, but profit booking saw the market to the lows of the day at 8630 only to see the buyers taking control to close near the highs of the day at 8730.30, huge gain of 90.15 points. The broader market though was just positive, with 795 advances to 716 declines. Developing Range as per Option Table stays at 8400-9000. Call option 8900-9200 added 4.40 lacs OI with short covering seen at 8800 and lower strike prices. Put option 8800-8700 added 6.68 lacs OI with profit booking seen at 8600 and lower strike prices. 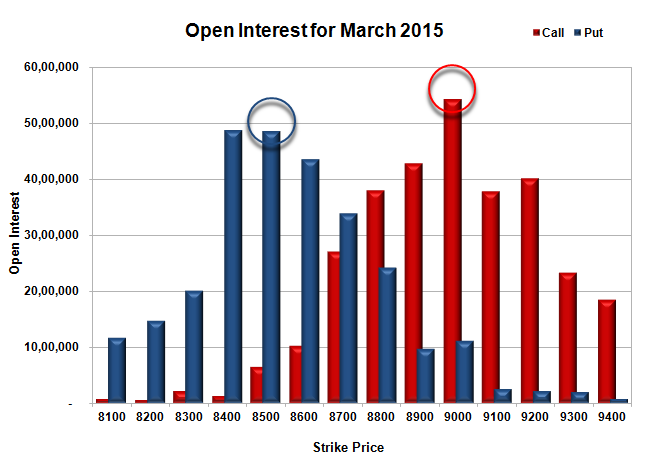 Nifty Open Interest is at 2,41,31,625 down by 8,54,425, with increase in price, most probably huge short covering. Bank Nifty Open Interest is at 24,55,700 down by 1,99,250, with increase in price, most probably huge short covering. FII’s sold huge 5.45 lacs Futures, which includes 21197 contracts long liquidation and 608 contracts short build-up, with decrease in net OI by 20589 contracts (includes 49085 longs to 70890 shorts for the day) and the Average Price comes to 8939.92. FII’s Index future open contract as on date is 766598 Longs to 123033 Shorts, net long 643565 down by huge 21805 contracts. Initial support now at 8700, with huge OI addition of 5.74 lacs and below that at 8600 with huge OI of 43.51 lacs. 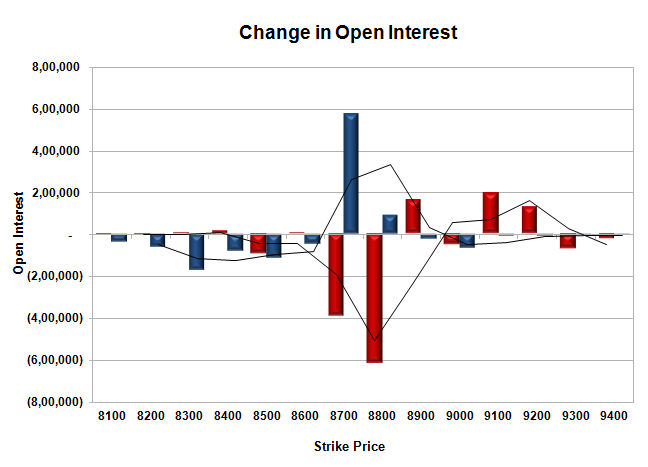 Initial resistance at 8800, with OI of 38.09 lacs and above that at 8900 with huge OI of 42.76 lacs. 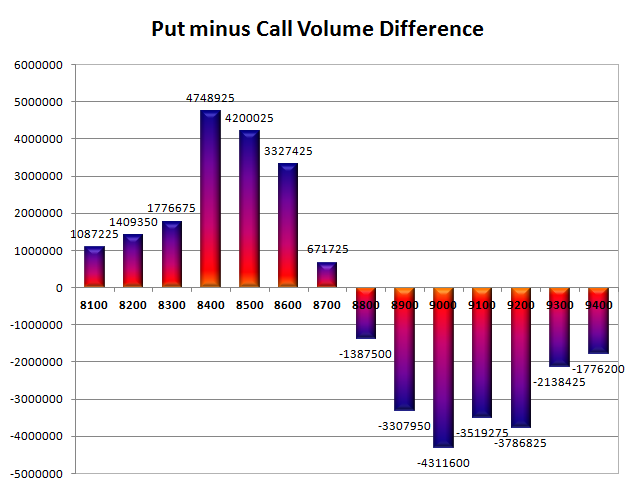 Day Range as per Option Table is 8619 - 8794 and as per VIX is 8654 - 8792 with 8699 as the Pivot.